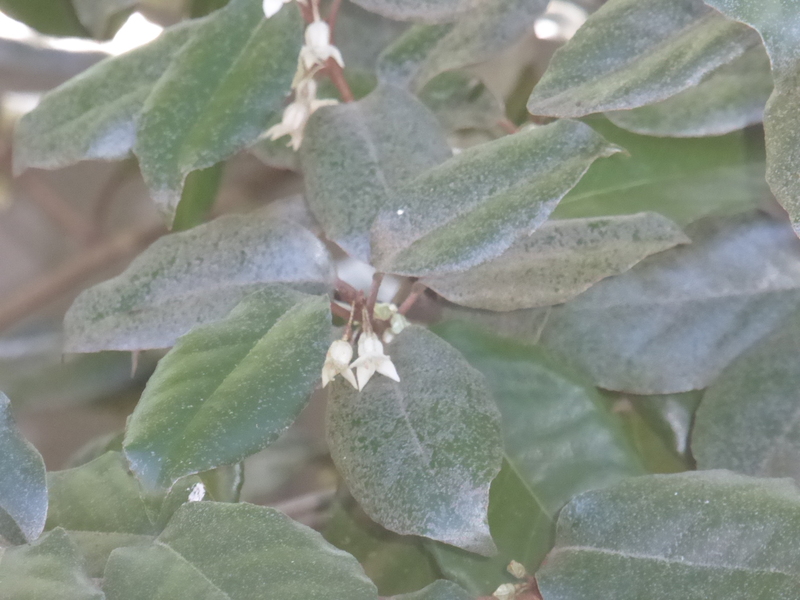 This is one of 2 Silverberry plants that I bought many .. many years ago. Tough as nails these plants are. They survived neglect (kept in a plant pot out in the garden .. forgotten) and although they didn’t grow much, they didn’t give up. Bless em. 4 years ago I finally planted them and last year they started to flower. These plants are quite large now and I’ve begun pruning them. The flowers are a positive sign that they are happy …and I’m loving them for hanging in! This is just a small section to show the flowers up close .. there are hundreds of these tiny little beauties of joy. A few days ago I was removing plants that had come to the end of their growth .. trying to make some space for kale,spinach and mizuna plants. 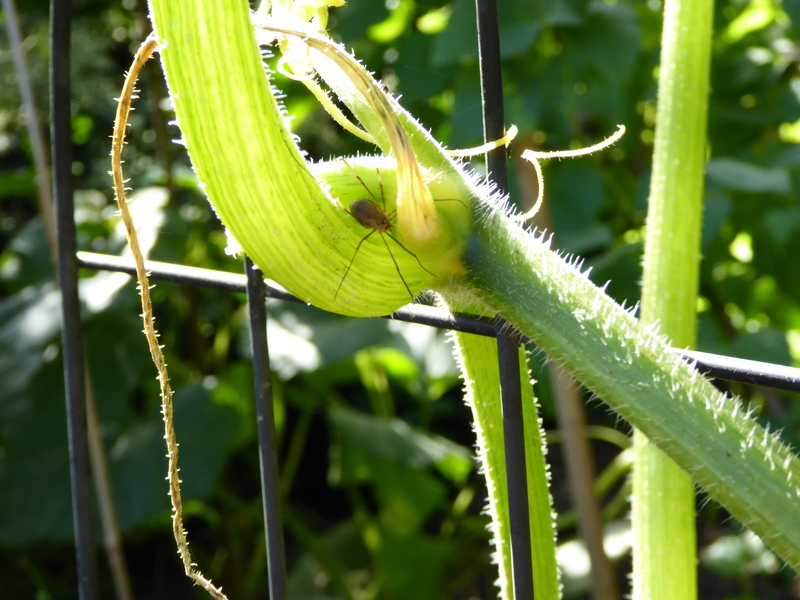 I noticed this spider had settled in on the squash vine .. so, not wanting to disturb him … I left the removal of this spent vine for another day. Finally all the seaweed sacks were emptied, the seaweed either dug into the soil or put in the compost bins. These were then rinsed thoroughly and draped on the conduit frame and bamboo, wherever there was space .. to dry and soak up the sunshine. Ready for another trip sometime in the future. At the end of the day …. 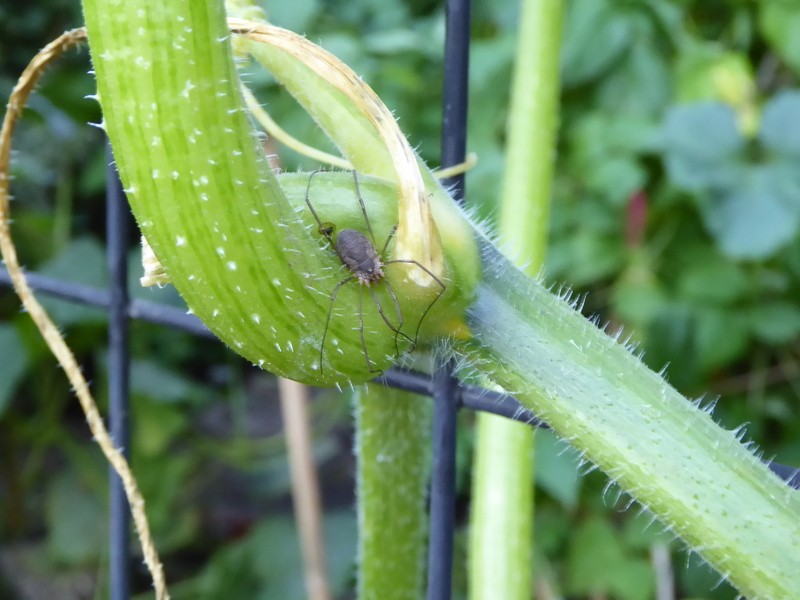 spider was still there … he looked settled in so I left him in peace. 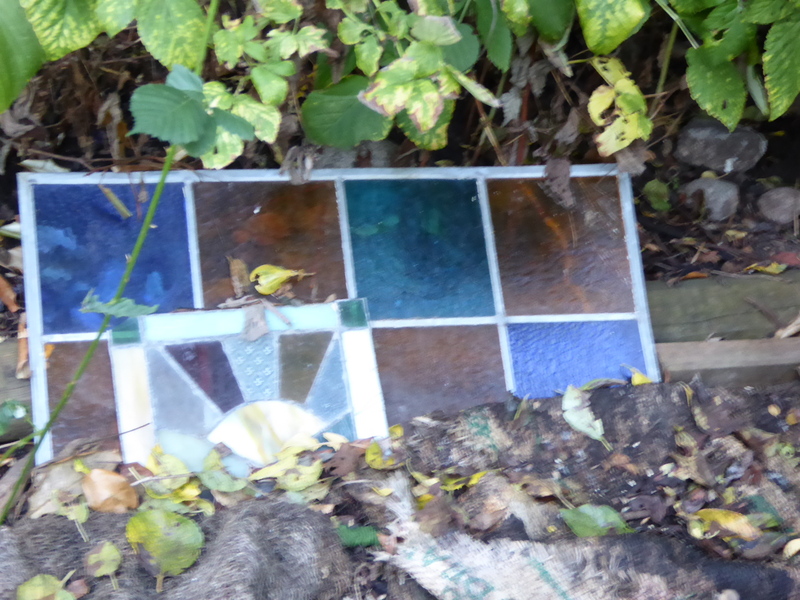 Part of an old window from our house and a little stained glass sunburst them I made years ago. Just waiting for me to re-purpose them into something artsy for the garden. For now they will just stay put .. pretty to look at and not in the way of anything. 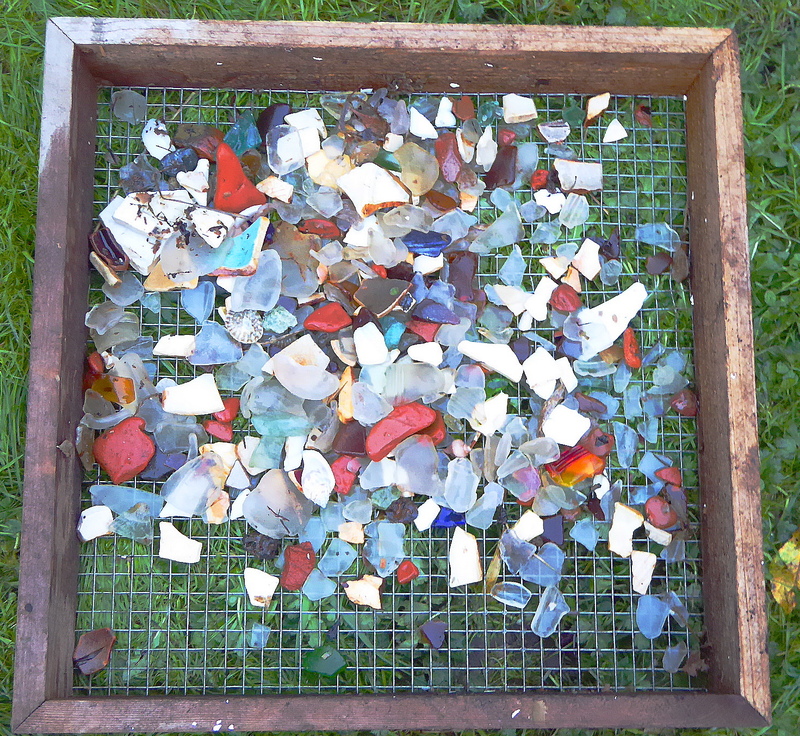 Last year my pal D and I went to the beach shores in Sidney, there is a small section which receives a lot of broken ceramics and bricks .. washed ashore from a nearby island. Lots of treasures to be found .. I might sprinkle some into a fairy garden, they would be perfect. 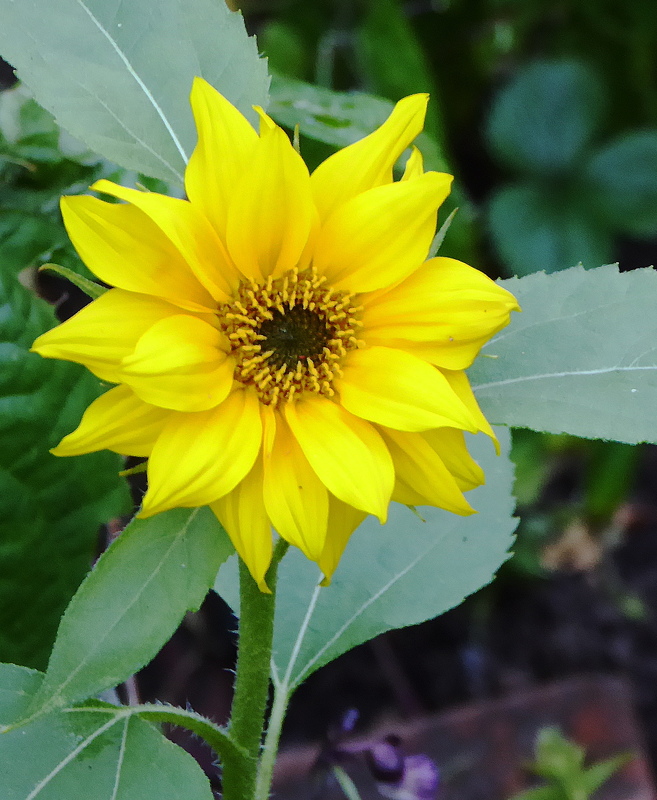 Each sunflower is different, some have broader petals, smaller faces .. each one is beautiful. 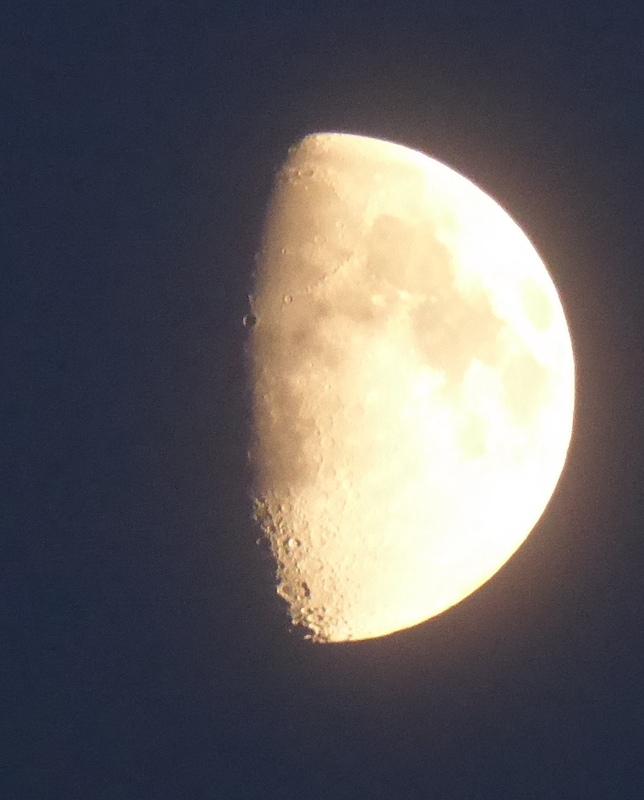 The moon two nights ago .. 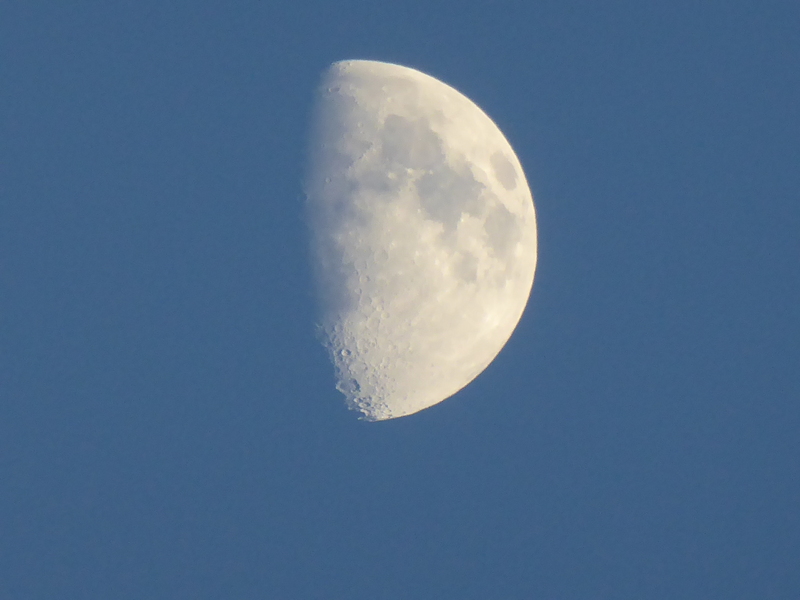 I was playing with my camera to see how close I could aim with the 30 zoom (Panasonic Lumix DMC-ZS40) …. 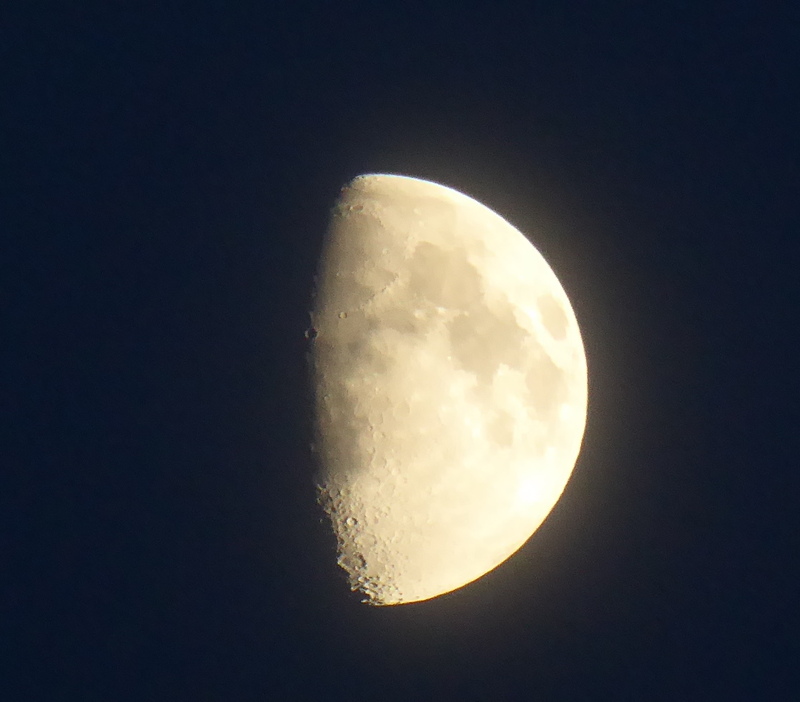 loving this camera .. here are some views that I took .. 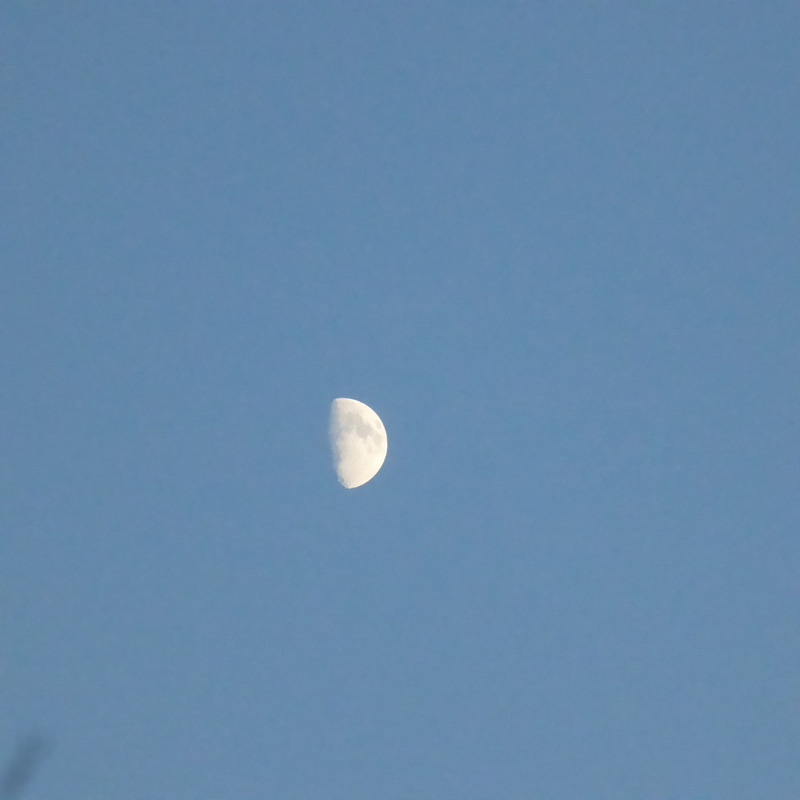 The moon doesn’t really seem that far away .. shapes and craters can be seen ..
And just as I finished my little tour around the garden .. 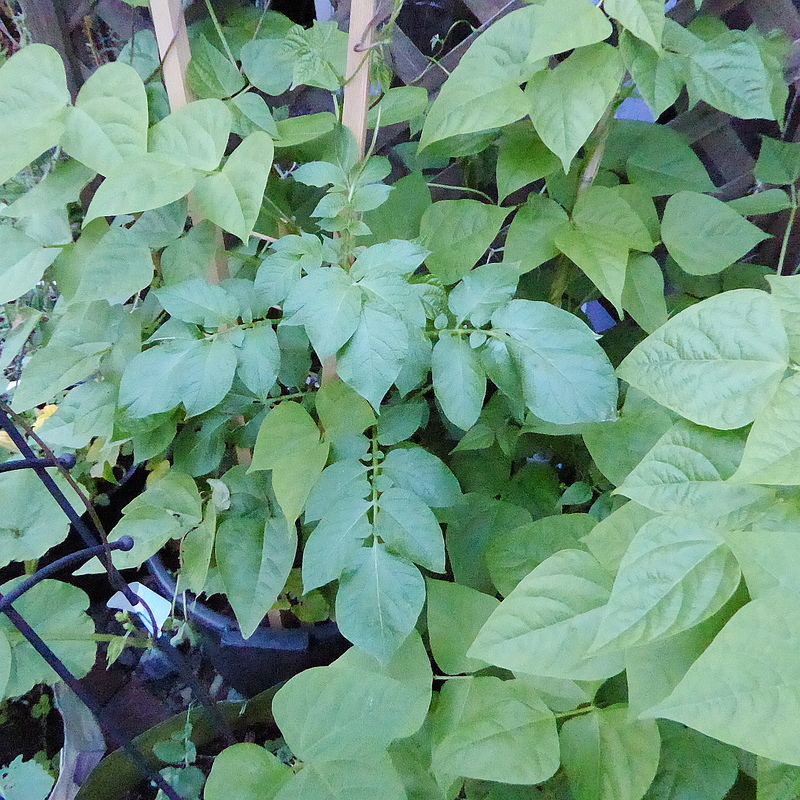 I noticed that a potato had been growing away in bean container. Fancy that .. I must have used some compost here .. it will be interesting to see if I harvest any little taters here! Well .. its’ a new day, lots to do .. .which includes a garlic workshop at the Victoria Compost Centre later on in the day. I intend to learn a lot about this lovely crop! Categories: Gardening | Tags: ; silverberry, beach ceramics, Garlic, Panasonic Lumix DMX-ZS40, Seaweed, spiders, squash plants, stained glass, sunfowers | Permalink.